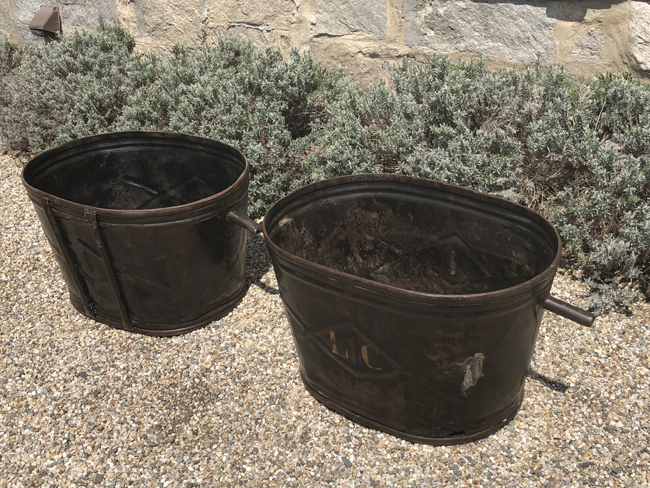 This pair of steel wine-harvest buckets has been burnished to a stunning patina and would make wonderful planters or accessories in your wine cellar. From Burgundy, they both have a beautiful raised horizontal diamond design on the exterior with four vertical ribs and are totally solid. One has been monogrammed "LC" in yellow on one side, but the lettering has faded over time. There were a few small holes in the bottom of one when these photos were taken, but these minor flaws have been restored and the buckets are now watertight. Of course, we are happy to drill drain-holes if your intent is to use them as planters. They both measure 27.5 in wide (without handles) x 35 in wide (with handles) x 21.75 in deep x 17.5 in high.